Dr. Emily Scherb, PT, DPT is a physical therapist with a lifelong passion for aerial arts. 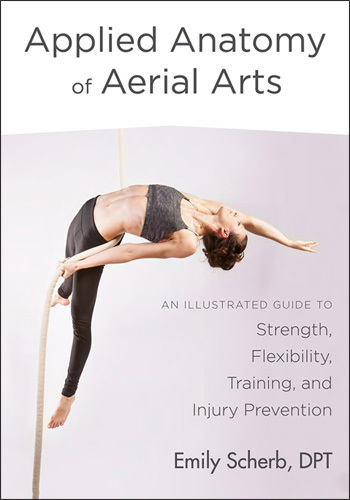 Dr. Emily Scherb’s book Applied Anatomy of Aerial Arts is now available! Emily has written the first anatomy book specifically for aerialists. Learn how your body works when it is hanging, inverting, climbing, or doing a hipkey. Strong core? Don’t forget your pelvic floor! Coaches are constantly talking about “engaging your core” but why is it important? And what the heck is your “core” made up of? The middle of our body, below our ribs and above our pelvis, has less bony structure than the rest of our body. You are teaching a student a new skill. You know they have the strength and are ready. So, what will happen next? Subscribe for training resources, notifications of upcoming workshops and events, and more.